The Left is angry—angry at President George W. Bush, the war in Iraq, the “right-wing media,” and more. 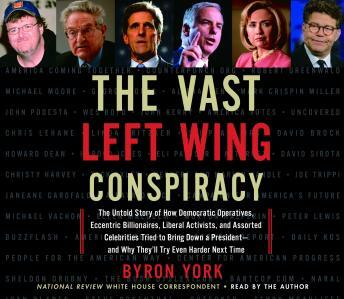 And as National Review investigative writer Byron York reveals in this stunning, meticulously reported book, liberal activists have harnessed that anger to build the biggest, richest, and best organized political movement in American history. Indeed, the Left’s failure to oust President Bush in 2004 has obscured the fact that this new movement has transformed American politics. York documents the staggering scope of liberals’ efforts—the record sums of money spent, the “shell game” financial maneuvers, the close coordination between “nonpartisan” groups and the Democratic Party, the revolutionary approaches to fund-raising and reaching out to voters, the pioneering use of movies and websites as campaign tools, and more. The Vast Left Wing Conspiracy provides a startling behind-the-scenes look at this powerful liberal movement. York brings the reader into secret powwows at Soros’s Hamptons estate, into the Chinese restaurant where MoveOn is born, to a gala event where Al Franken rants about the evils of the right wing, to fund-raisers where liberals openly mock the election laws they’re ignoring, to the movie premiere where Michael Moore is feted by top-ranking Democrats, into the Washington restaurant where Democratic operatives hatch their plan, and to many other spots along the way. One thing above all becomes clear: Despite their failure to win in 2004, liberals will only keep improving the well-oiled political machine they built.